eat, drink & be vegan: Things That Make You Go.... Mmmmm! Things That Make You Go.... Mmmmm! Next up, Artisana Coconut Butter. I mentioned Artisana's Raw Cashew Butter in a post way back. I still love that product as well. 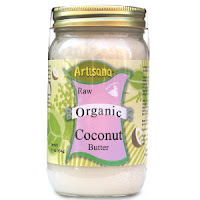 And, you'll see this coconut butter in a whole bunch of my new recipes, like my raw truffles. Coconut butter is different from coconut oil in that it is not just the oil of the coconut, but the meat of the coconut that is blended into a 'butter'. It is quite solid at room temperature, but that texture lends itself well to many recipes (such as the truffles). 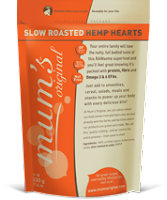 For my local followers, I used to have to order this online, but Choices has been carrying it in recent months (in the aisle with other oils, rather than in the refrigerated section with the coconut oil). Yes, this butter is fairly expensive, but so is coconut oil. It's worth its weight in gold, I tell you! Artisana has other raw nut butters, fyi. Those roasted hemp hearts sound fantastic! Gotta try them! Coconut anything is super good for you! It is another miracle element! I use a lot of coconut in my cooking! Check out my online cookbook at e-Eatery.blogspot.com and let me know what you think!